Rent Clover's Fine Art Gallery | Corporate Events | Wedding Locations, Event Spaces and Party Venues. Contemporary art space geared toward artists of Caribbean heritage, with cafe & gift shop. Approximately 2,000 square feet, this space is excellent for a wedding, fundraising party, cocktail party, music recital or corporate event. This loft-like space with exposed brick, hardwood floors and high ceiling is also ideal for intimate social gatherings such as a bridal or baby shower, anniversary party, sweet sixteen, bar/bat mitzvah or milestone birthday celebration. Your group will have access to private viewings of the gallery’s rotating thematic art exhibits further enhancing a unique and memorable experience! 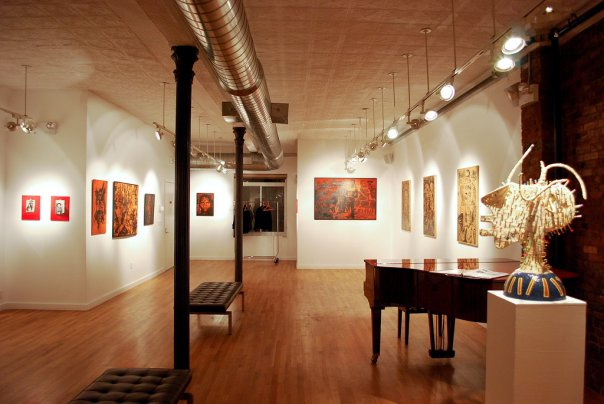 The gallery space is also great for music events and location/photo shoots. The space features a baby grand piano and is equipped with an audio system and wireless internet access.